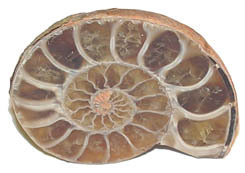 Scheuchzer�s student, Baier, wrote the book, �Nurnberg Petrology� in which he assembled a large number of Ammonites to show they were not freaks of nature, but true shells, and that most fossils had resulted from Noah�s flood. The compelling Science of Scheuchzer and Baier forced people to accept that fossils were indeed the remains of previously live creatures and propelled Flood geology into main stream science. Ammonites were not named after the Biblical Ammonites (descendants of Abraham�s relative, Lot - Gen 19:38, Deut 2:20), but after an Egyptian god. The shape of their shells suggest the curling ram horns on the Egyptian god, Ammon. Ammonite means �Ammon stones�. Goniatite means �angle stones�, and refers to their distinctive angular growth lines. Each year the creature in the shell would add a larger chamber to the front of the shell, and the animal would move into it. Where the new chamber joined the old one was an angular growth line. Goniatites had a smooth globular shell with a small but prominent depression at the centre.